Australian Society of Ju Jitsuans (ASJJ) … The formation of the ASJJ really became structured in the mid 1950s when many different jujitsu schools joined together under a common bond. The bond between those schools brought about a standardisation in the teaching, competency and assessment criteria. This teaching standard applied throughout the ASJJ through to the mid to late 1970s. At that time two significant developments encouraged the ASJJ to restructure its membership criteria. These developments were the proposed introduction throughout Australia of what would become the National Coaching Accreditation Scheme (NCAS) and the formation in Victoria of the Martial Arts Council of Australia to satisfy a direction of the then Commonwealth Government. Changes to the membership criteria opened the door to schools that wished to join the ASJJ while maintaining through their teaching and assessment criteria, their own style in jujitsu . With these changes the ASJJ became an organisation representing the views of many different styles of jujitsu. In the early 1980s the ASJJ gained recognition from the Australian Coaching Council (ACC), with the responsibility for administering the NCAS program for all jujitsu coaches / instructors across Australia. secondly to promote a common bond of sharing of knowledge while each school would maintain its own identity. the third objective was to enable those members who had lineage within the teachings of the ASJJ (pre the events of the late 1970s) to pursue a separate identity. This separate identity was achieved in 2004 with the formation of Koshinryu Jujutsu Australia (KJA) which became the principal member school of the AJF and retains a documented history of Jujutsu in Australia focused on the life and times of Ryugoro Fukushima and the Australian Society of Ju-Jitsuans with records of events in Australia dating back to 1878 plus details of all members past and present of the ASJJ Black Belt Register. 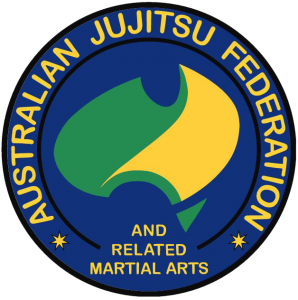 Providing representation throughout Australia the AJF is actually a federation of member schools or organisations that include jujitsu and related martial arts; modern (gendai) and traditional (koryu), both sporting and non-sporting. During 2004 the AJF as the eminent jujitsu organisation in Australia, renewed its pursuit for formal recognition for jujitsu from the Australian Government. These renewed efforts resulted in recognition being achieved on 8th June 2005. Today the Australian Government through the Australian Sports Commission (ASC) recognises the Australian Jujitsu Federation. In 2008 members amended the AJF constitution to further reinforce the membership provision for related martial arts, and in 2009 the Australian Sports Commission approved the administration by the AJF of the NCAS accreditation program be expanded to include: aikido, aiki jujitsu, hapkido, and kenpo jujitsu, this being in addition to jujitsu and Brazilian jiu jitsu. In 2010 the Australian Sports Commission also approved the AJF administering the National Officiating Accreditation Scheme (NOAS) for Sport Jujitsu, Brazilian Jiu Jitsu, and Grappling. Participate (if they choose) in competition, in a spirit of friendship together with the opportunity to represent Australia at World Titles. A ‘Code of Behaviour’ approved by the Australian Sports Commission. To provide or support opportunities for interaction between members of the AJF and overseas schools and masters. To provide recognition for individual achievement; while member schools retain their independent grading authority. Recognised by the Australian Government through the Australian Sports Commission, our role and objectives include the promotion and representation of jujitsu and related martial arts both within the world of martial arts and with Australian government and non-government authorities involved with: the martial arts, budo, and/or the development of sport. To strive to provide the community with a standard of quality in the teaching and coaching of martial arts within schools satisfying the criteria of becoming a ‘Member School’ of the AJF, which includes achieving National Coaching Accreditation under the National Coaching Development Program of the AJF.